Why is resolving investment disputes on the Investment & Human Rights Map? During the life cycle of an international investment, disagreements may arise between business investors, or between business investors and either the host State or entities representing the State. In such circumstances, there are a number of ways in which disputes can be handled, depending on whether the dispute concerns compliance with domestic law, an alleged breach of contract or an alleged breach of an international investment agreement (‘IIA’). Domestic laws, contracts and IIAs will determine the availability of dispute resolution mechanisms and the relevant procedural rules. Some of the most common dispute resolution mechanisms include domestic administrative or judicial procedures, arbitration or mediation. Domestic courts offer the traditional path for the resolution of disputes and involve the exercise of the State’s judicial powers to achieve a legally binding resolution of the dispute. In the context of cross-boundary economic activity, alternative methods to national courts are also used. The development of these alternatives has been spurred by business enterprises seeking speedy, specialised forums that are independent of the host State to resolve disputes relating to their international business ventures. Arbitration can be used as a method to resolve disputes only if both parties have expressed their consent to do so. Their consent also includes the choice of the procedural rules. These rules govern the arbitration proceedings and cover issues such as the constitution of the tribunal, the potential participation of third parties, the rendering and possible publication of decisions, and the determination of costs. The disputing parties submit their dispute to an arbitral tribunal (usually composed of either one or three arbitrators) of their choice. The decision of the arbitral tribunal (also known as an ‘award’) binds the parties and is enforceable in domestic courts. That means that if a losing party refuses to abide by a decision, a winning party can ask a domestic court to compel the other party to comply. In general terms, when the dispute concerns a breach of contract by one of the parties – be it between private parties or between the investor and the State – the arbitration process is called ‘commercial arbitration.’ When the dispute concerns the breach of a State’s obligations under an IIA, the arbitration process is called investment treaty arbitration or simply investment arbitration. The term Investor-State Dispute Settlement (‘ISDS’) is also used. However, the use of these terms is not consistent and may at times be confusing. For further discussion of this distinction, see the Arbitration section of the Learning Hub. The parties to a dispute can agree to use mechanisms other than those described above. For example, they may agree to find an amicable solution to resolve their dispute, either between themselves (negotiation), through the intervention of a third party in mediation or conciliation, or with the help of an independent expert. Among the different dispute resolution mechanisms available, investment arbitration has attracted the most criticism due to both its growing importance and the alleged negative impacts that the process and outcomes can have on sustainable development and human rights. Investment arbitration has grown in importance over the last decade as investors have made use of the arbitration option provided in a majority of the more than 3,000 existing IIAs. According to the United Conference on Trade and Development (‘UNCTAD’), the total number of investment arbitration cases filed worldwide reached 540 at the end of 2012, with 58 new cases filed in 2012 alone, confirming that investors are increasingly resorting to investment arbitration. Criticism of investment arbitration has grown in tandem with the exponential rise in its use. Of particular concern are the lack of transparency in the arbitration process where the exercise of State authority is being reviewed, the alleged failure of arbitration to consider and reflect public interest concerns, and the financial implications of arbitration for States’ budgets. significant amounts of public money are wrongly diverted from public goods and services to pay for arbitration costs and awards. Other forms of dispute settlement have not received the same level of attention as investment arbitration. However, human rights issues can also be relevant. For example, what is the relevance to human rights of the enforceability and application of stabilisation clauses in State-investor contracts? What may be the impact of the corporate responsibility to respect human rights in the context of contractual relations between businesses? As mediation and conciliation can involve investment and commercial disputes, questions may arise as to the handling of issues of public interest or possible impacts on human rights of agreed settlements. There is an urgent need to better understand the relationship between human rights and dispute resolution in the context of investment and to ensure that procedures and outcomes do not undermine the protection of or respect for human rights. The Investment & Human Rights Map invites targeted consideration of how a number of investment dispute resolution processes and outcomes may connect with human rights, and seeks to stimulate reflection on ways to improve such processes and outcomes. The Learning Hub’s work on ‘resolving investment disputes’ will contribute to building understanding of arbitration and other mechanisms – and their relationship to protecting and respecting human rights in the context of investment. The Hub will explore the concepts relating to and functioning of the respective mechanisms and identify a current agenda for the discussion on human rights. The Learning Hub’s initial work in this area will focus on investment arbitration, given the breath of State conduct involved, its widespread use and the state of play of the debate on its impact on sustainable development and human rights issues. This will present a useful starting point for broader reflection on other types of mechanisms that may have a role in ensuring that human rights are accounted for and integrated in each context. 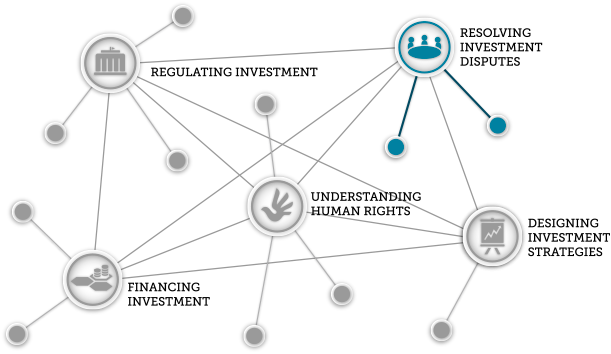 One of the aims of the Investment & Human Rights Map is to help users identify methods of addressing the criticisms levelled at dispute resolution mechanisms through levers of change in areas beyond the mechanisms themselves. To identify these levers of change, it is useful to consider issues relevant to investment policymaking, including State-investor contracts and IIAs, international human rights law, and the growing universe of investment-related standards that address human rights issues. Further, it may be useful to explore the connections between dispute resolution and both the design of investment strategies and the financing and insuring of investment.